(2017) Unconsciousness between phenomenology and psychoanalysis, Dordrecht, Springer. In the present contribution, the phenomenological unconscious is approached not in the sense of the psychoanalytic unconscious but on an "infra-conscious" level, below the "given," as it were. I outline a threefold account of the "pre-conscious." The three fundamental types of the phenomenological unconscious (in the narrow sense of the word) are: the genetic phenomenological unconscious, the hypostatic phenomenological unconscious, and the reflexive phenomenological unconscious. I explore how the phenomenological unconscious intervenes in the articulation between consciousness and self-consciousness. It is the Husserlian model of an "omni-intentionality" with its "nuclei" that makes it possible to clarify the status of self-consciousness (at the level of the phenomenological unconscious). I end by highlighting the plurality of fields corresponding to different "spheres" of the phenomenological unconscious. Schnell, A. (2017)., Reflections on the phenomenological unconscious in generative phenomenology, in D. Legrand & D. Trigg (eds. 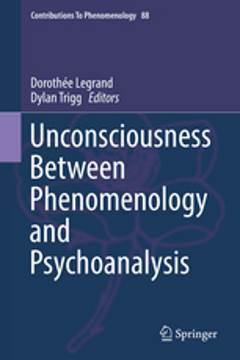 ), Unconsciousness between phenomenology and psychoanalysis, Dordrecht, Springer, pp. 25-37.